1. Heat ghee and oil in a heavy bottomed pan. 2. Add bay leaf, cardamom, cloves and saute for a minute. 3. Add the onions, green chillies, green peas and stir well. 4. Add the ginger garlic paste, coriander leaves, mint leaves and salt. 5. Stir till well combined. 6. Pour the coconut milk and 1 cup of water. 8. Now add the rava, lemon juice and stir well. 9. Simmer for 10 minutes on low heat till most of the water has evaporated. 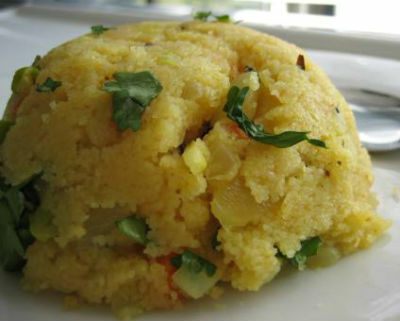 Feel free to comment or share your thoughts on this Spicy Rava Kichadi Recipe from Awesome Cuisine.